St. Marcus exists to provide a Christ-centered place where children can learn, grow and develop in an environment of exceptional academic instruction, individual attention, discipline, love and respect for diversity and faith in God. 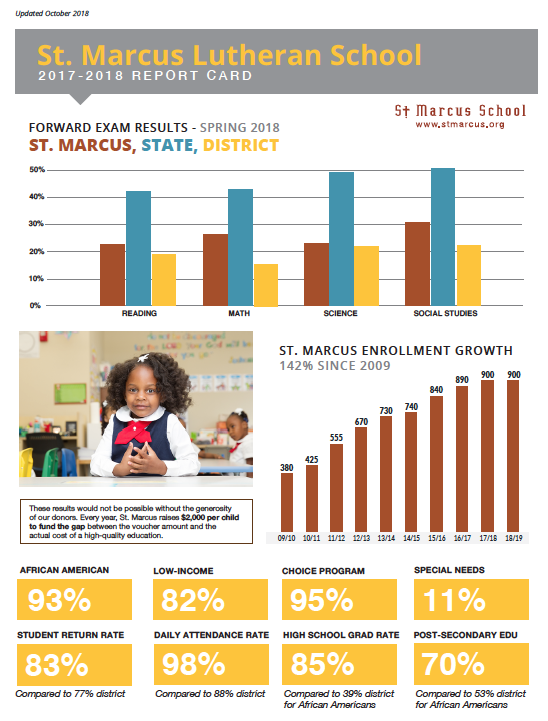 The earlier St. Marcus reaches students and the longer they are at St. Marcus, the more likely they are to succeed. St. Marcus students perform among the very highest levels in the city of Milwaukee. View the full report card. But even strong children have to battle their surroundings as they grow up in the city of Milwaukee. St. Marcus is committed to every child’s success and well-being. NO EXCUSES. There are ninety-six 80/80 K-8 schools in Milwaukee, serving almost 30,000 students. The average reading proficiency rate in these ninety-six 80/80 schools is 8.6%. This number is half of the already low district-wide proficiency rate of 19% and a fifth of the state proficiency of 42%. Math scores are even lower. 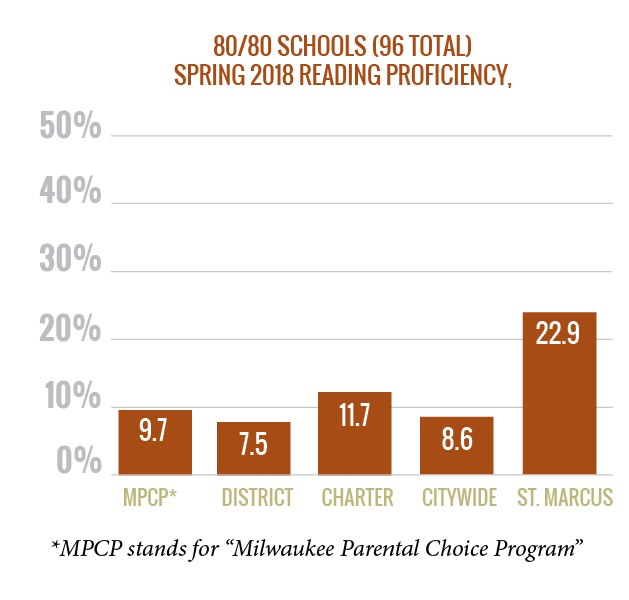 Though district, charter, and voucher sectors are all failing, there are schools striving to outperform the odds and give children bright futures like Milwaukee College Prep (MPS), LUMIN (MPCP), and St. Marcus Lutheran (MPCP). We must work together to educate all children. Expanding successful schools, no matter the sector, is the best way to lift up Milwaukee’s future leaders. How can you help? Visit St. Marcus School’s Main or North Campus to see scholars learn and explore how you can be part of the solution. St. Marcus knows what works and what it takes to open doors of lifelong success for students. St. Marcus’ record of success is well documented.